The bulk of the time spent so far has been going through each item in Mr. Gettler’s correspondence, which contains approximately 1000 items. Every piece has been examined for a sender, recipient, date, subject, and format. That was a lot of reading! It’s been interesting to read Mr. Gettler’s interests come through in his political correspondence, as well as seeing the often-contentious battles regarding S.O.R.T.A.’s operations. I must admit, it’s been hard to stop examining the documents and start writing about them. Next I will be going through the contents of all of the correspondence folders and placing them in chronological order. Fortunately, Mr. Gettler was well-organized and his papers are in a good logical order, which will be maintained. I will still be considering the general strengths of the collection, and arrange it accordingly to maximize its research value. As I arrange the contents the contents into series, I will be placing all of the items into new, archival housing. This includes sending some items, like the jelly beans, to the Preservation Lab for specialized care. 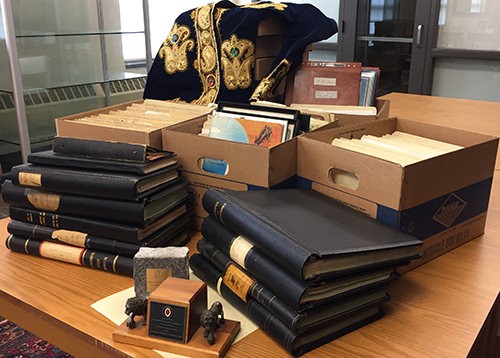 Now that the entire collection is completely inventoried, I will also begin digitizing select items for a web exhibit highlighting the collection. The digital images will also be permanently stored in the University of Cincinnati Libraries digital repository. There are still more interesting items in this collection that I’d like to feature in the blog, so please stay tuned!